OK, so I don’t know about your husband, but there’s something about Father’s Day that brings out Mike’s inner cave man. And when I say “inner cave man” I am referring to the innate, undeniable desire for a big ‘ol piece of meat on his plate for dinner. We eat meat. I like it too. I’m just sayin’ that it seems like guys like it a whole lot more than we do. Funny enough, although I’m not a big meat eater, when I do eat meat, I really prefer it on the bone. 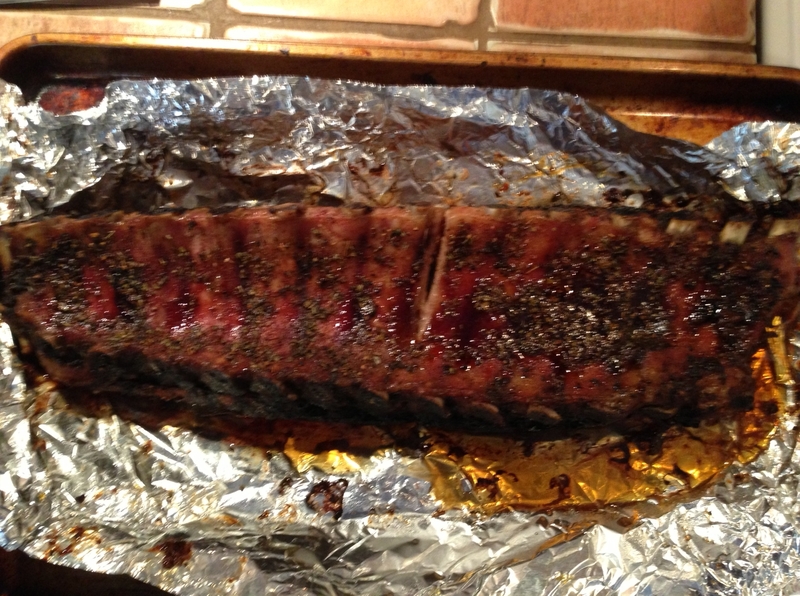 Cooking meat on the bone always yields more flavor; any foodie can tell you that. But I like the bone there too. Can’t really explain it but there you go. So as we are not even close to getting into a summer groove yet, allow me to get right to the point and back to a bunch of tasks that, for whatever reason, have yet to be completed in my home. Ingredients: (which, by the way, I do not actually measure. Big shocker, I know.) 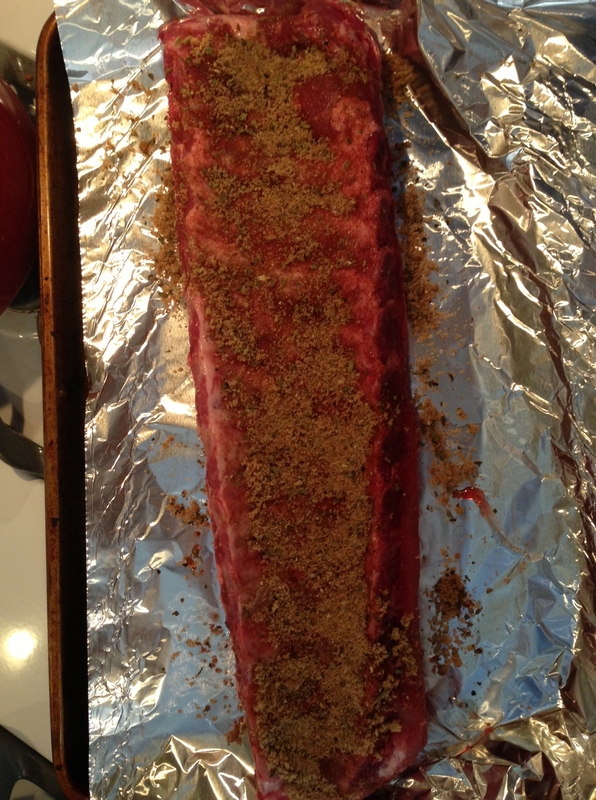 your basic rack of pork ribs–3 or so pounds, 1/2 cup loosely packed cup of brown sugar, 1 tbsp. chili powder, 1 tbsp. oregano, 1 tbsp. garlic powder, 1-2 tsp. cayenne, few healthy shakes of salt and black pepper. 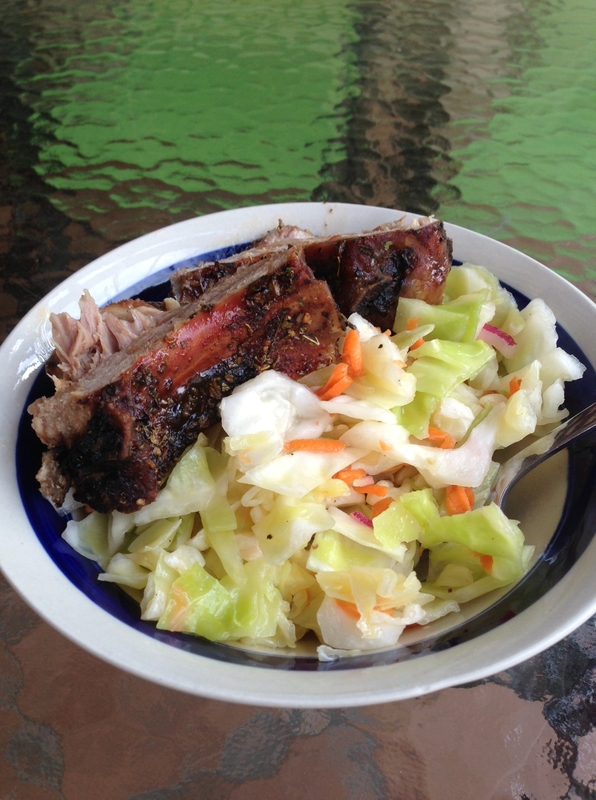 I recently served my ribs up with some cole slaw, as pictured above (see my recipe under salads) which was pretty much the tastiest dang combination we’ve had in a while. Cave man happy = good Father’s Day. Play around with your rub. It’s cool and very “in” right now! Try things like onion salt, cumin, celery salt, paprika, chipotle powder… Hope you enjoy!